A solitary, tall, salt-tolerant, moderately slow growing, monoecious, forest emergent, brown coloured crownshaft palm. Rare in cultivation, vulnerable in the wild. It has a smooth, grey-brown trunk, 20 m. (66 ft.) tall, 30.5 cm. (12 inch) diameter with spaced ring leaf scars, and large segmented, pinnate (feather) leaves, 3 m. (10 ft.) long, 0.9 m. (3 ft.) wide, dark green above and, light green beneath. Satakentia liukiuensis can survive freezing temperatures to about -3.8°C (25°F), but freezing is best avoided. This species naturally occurs on islands in moist montane forest, and is heavily effected by the surrounding sea temperatures, which are constant and often form sea mist and cloud. 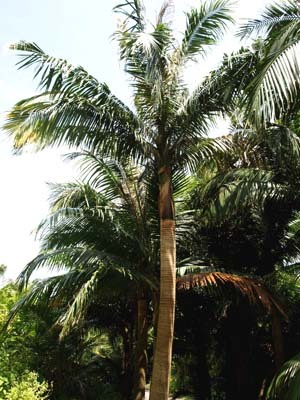 In this type of natural environment temperature fluctuations are slight, and this palm prefers a constantly mild climate with little temperature difference between day & night, and Summer & Winter. Under extreme freezing conditions we recommend you keep this palm as dry as possible, and well wrapped up. Stems are tall and solitary, ringed with prominent leaf scars, and usually have a mass of adventitious roots at the base. Leaves pinnate, 10-14 in number, and dead leaves fall cleanly from the stem. leaf sheaths are closed and form a prominent, brown or reddish green crownshaft. Petioles are usually very short. Leaflets are numerous, regularly arranged, one-veined, lanceolate, and spread horizontally in the same plane. Inflorescences are branched to two orders, and are borne below the crownshaft. They are covered initially by deciduous bracts - a prophyll and two peduncular bracts. Flowering branches are densely hairy. Flowers are unisexual and are arranged in trees or a central female and two lateral male flowers. Fruits are small, ovoid or ellipsoid, black, and one-seeded. The endosperm is homogeneous, germination is adjacent, and the seedling leaf is bifid. 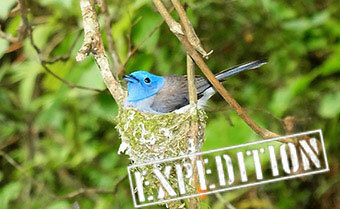 There are two main wild populations, the main population on Ishigaki Jima, and a much smaller population on Iriomote Jima with a few individule trees scattered across Iriomote. Widely planted as a street tree in cities further north, notably Naha on Okinawa.